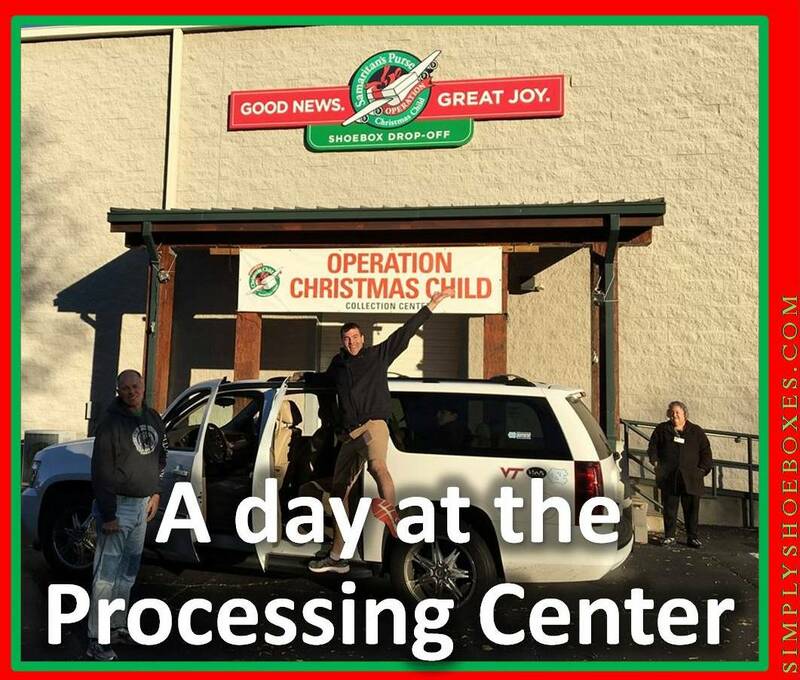 I know many people wonder what happens at the Operation Christmas Child Processing centers. Since I haven't been in a few years, I asked Stephanie Seymore who is an Area Coordinator for Lower Eastern NC area team and runs the FACEBOOK page called "Shoebox Shoppers" to share about it. 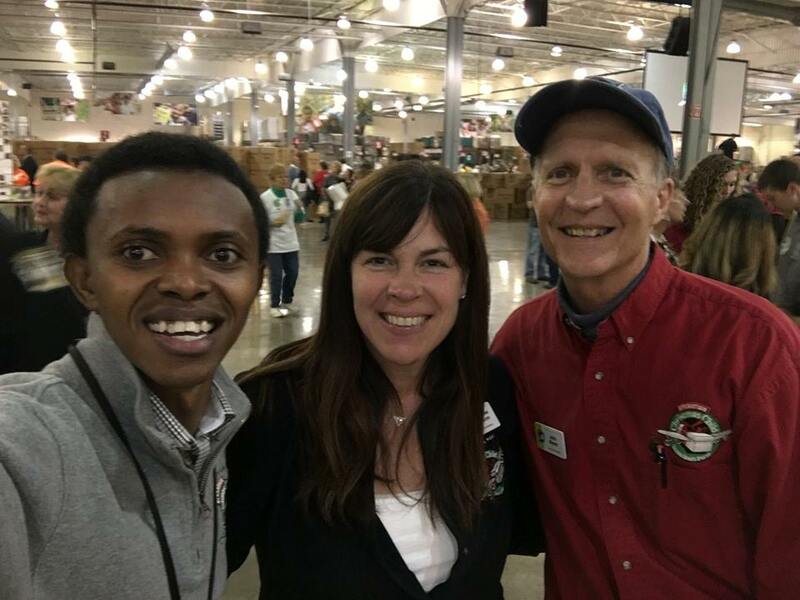 If you love to pack shoeboxes and haven’t had an opportunity to go to one of the Operation Christmas Child Processing Centers you need to try and make it happen. There are processing centers in Baltimore, MD, Charlotte, NC, Boone, NC, Atlanta, GA, Dallas, Tx, Minneapolis, MN, Denver, CO and Orange County, CA. OCC headquarters are in Boone and the largest processing center by far is the one in Charlotte. The Boone and Charlotte PC’s are permanent. 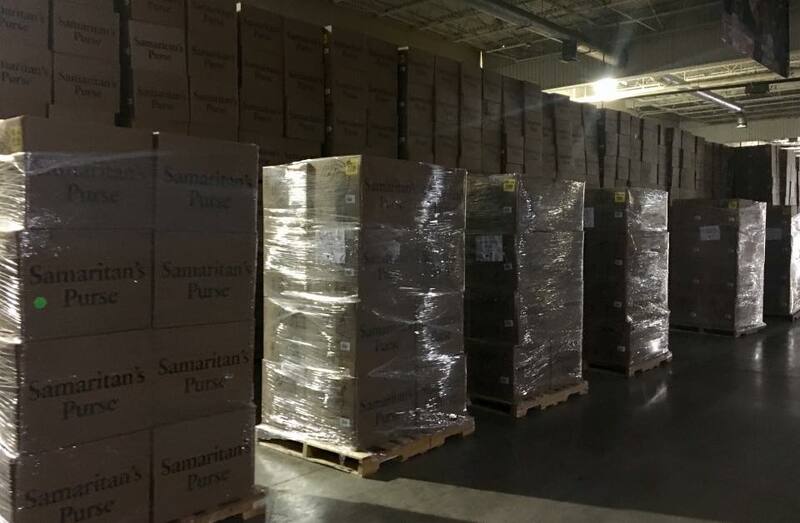 Boone is the headquarters for all the Samaritan’s Purse ministries and Charlotte houses the offices for the Carolina’s Region (the region I volunteer in) and processes the largest number of boxes by far. The others may change their location in that city from one year to the next as they are just there seasonally. 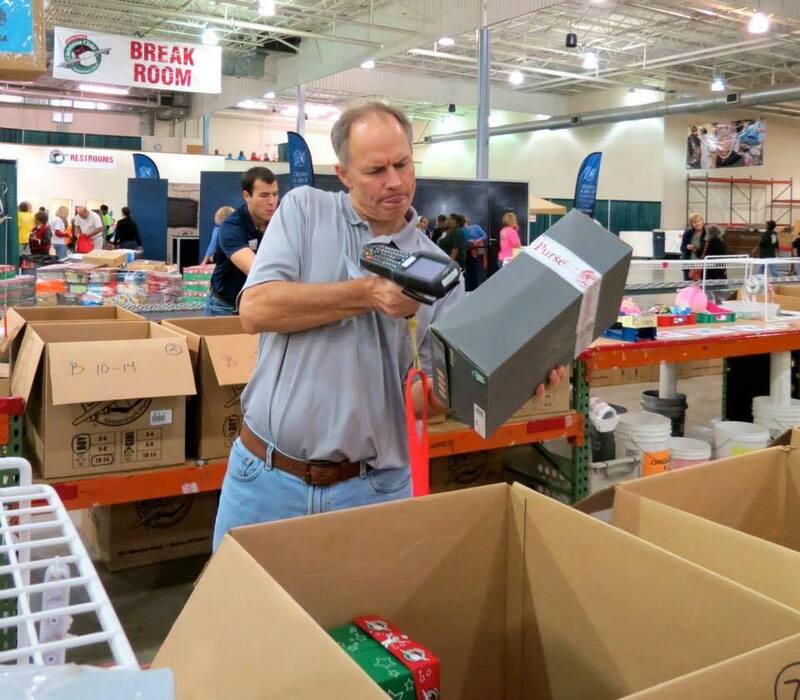 To make this whole process of inspecting millions of shoeboxes happen (in about 3 ½ weeks) the ministry needs lots of volunteers. That’s where we come in. :) Starting in late July or early August an online site opens through the ministry that allows people to sign up to come and volunteer at one of the PC’s. You can go online and register for yourself individually or for a group if you want to bring a church or some other group together. My church takes a bus and we take between 40-50 each year for 2 days of volunteering. I’m sharing about the experience you might have at the Charlotte PC. The others are smaller and may have some difference. When you reserve your spots online you will receive some information to fill out in advance to help the whole process go smoother when you show up for your shift. If you are in charge of a group you can get all this paperwork from them as well. I’m not sure how all the other PC’s work but the Charlotte PC has a list of hotels nearby that offer reduced rates for OCC volunteers. Usually the spots to volunteer fill up quickly so you want to reserve early. The Charlotte PC can handle well over 1000 volunteers at a time and this year they processed right around 2 ½ million shoeboxes in that 3 ½ week period. I was able to go twice this year and work several different jobs. Over the years I have done just about every job that is available and all of them are great fun! When you show up to work your shift at the PC you will sign yourself or your group in with the person at the door. You have your prefilled out paperwork and everyone gets his or her nametags. Various groups of around 50 get taken to various areas to watch a video welcome from Franklin Graham along with a video about the various things that will be happening during your visit. This year there was a new video and it was really cute. Afterward there is someone to answer questions. This whole process takes about 10 minutes. If you are working multiple shifts/days you only need to go through this process once. Once you are finished with orientation you go to the placers. I got to do this job this year for a morning and I have a lot of respect and appreciation for these workers. It’s a stressful job. Basically as the groups come up to be assigned there is a big board listing all the processing tables, filler areas, hospital, seated jobs, heavy lifting jobs etc. and that person keeps track of where everyone is going, how many people are in each place, how long they are staying etc. For the Charlotte PC that can be well over 1000 people. The board looks like a very large version of what a waitress uses at a large restaurant to keep track of where everyone is going. Once they determine how many are in your group you wait in line until you are escorted to your work area. At this point if you have males in your group they get excited and always ask if they are available to do heavy lifting jobs. Our church has always brought about 6 or so men including my husband and oldest son and they feel very special at this point. 😊 This year we had about 17 men so everyone was very glad to see us. If you have someone in your group that can’t stand for long periods they take them to the various sit down jobs. Usually they can bag soap and other filler items at tables. If they need people to work in the shoebox hospital repacking boxes that have broken or that have been damaged by liquids they will ask for volunteers and take you to those areas. The same applies for the various filler items. 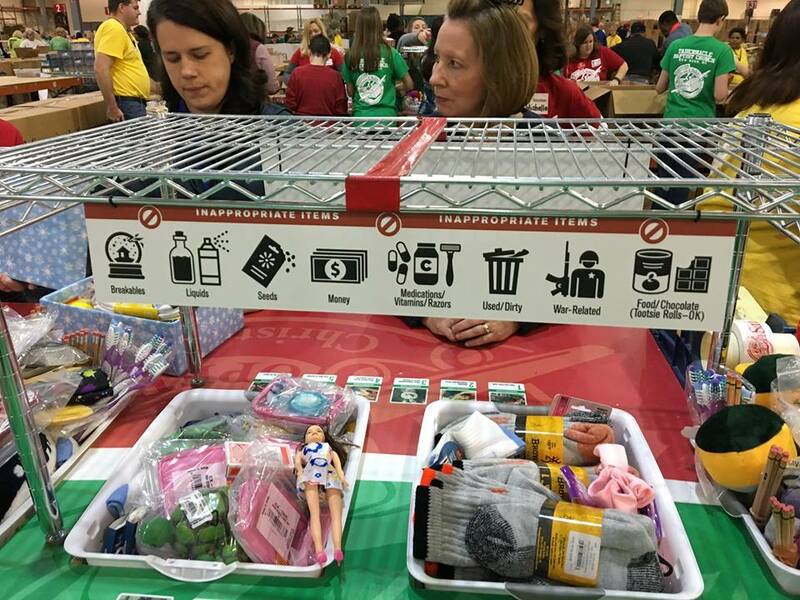 They need people to continually fill up the bins that contain filler items at each table. This is a busy job because so many boxes come in under filled and need a lot of help to make them able to be sent out. At the PC’s we plow through filler and often there isn’t enough. 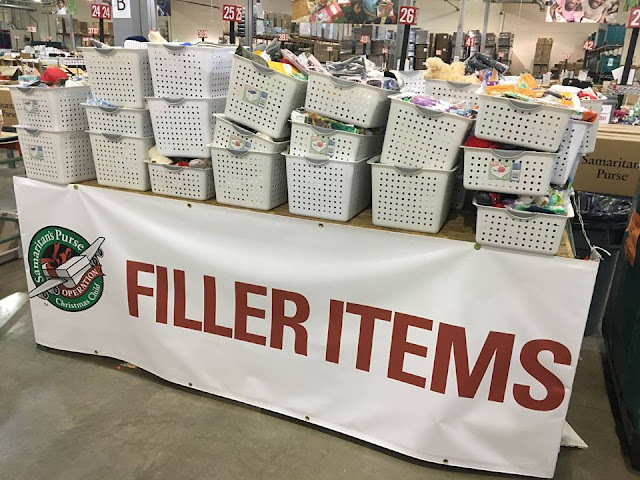 (side note) Everyone is welcome to send in extra filler items when they come to volunteer but in theory we can’t make a dent with our donated filler. What we need are LARGE donations from businesses and corporations to fill the need. I’m not saying not to send filler. But please don’t stop packing boxes just to focus on the filler. The ministry expressly asked us to tell people that. We need all the boxes we can get to reach all the many needy kiddos. What each of us can do is help teach people how to pack a good, full box. Everyone can educate. are 60 processing tables. I got to be a runner this year and it was a lot of fun. (This is actually a staff job but as a year round volunteer who was asked to be there for media day, I was able to fill in for someone who was sick that day) The runner takes the group to their assigned table, introduces them to the table supervisor and makes sure they have the right numbers etc. I feel like runners are super important because they are one of the first faces new people see at the PC. It can be a little overwhelming and a friendly runner can make all the difference. Once you get to your assigned table you will meet your supervisor. That person is supposed to go over the training you just received during orientation and show you where everything is on the table and with the cartons. With our group going every year this usually takes just a minute or two because they just have to show us any changes since the last visit. For a brand new group this could take 10 minutes to get everyone squared away. The supervisor will explain the various jobs and how many people they need to do each job at that time. Then people pick which area they want to go to. 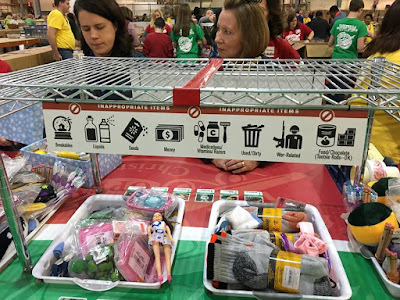 For a totally full table there would be 2 pre-inspectors (taking boxes out of cartons, removing rubber bands and taking out the donations for shipping). What to do with the rubber bands seems to change every year. However the general consensus seems to be to stick them in the shoebox for the child or sometimes groups save them to take back to their church to reuse at their packing parties. The supervisors seem to be fine with either option. A full table will have 4 inspectors (taking out inappropriate items and adding fillers where necessary). This is my favorite job mostly because it gives me an opportunity to share with all of you about what cool items I find and what interesting items I find. :) Once a box is inspected it is placed on the shelf in front of us and the taper grabs it and tapes it around the middle. A totally full table can have tapers on both sides of the table. Then it is placed back on the shelf for the cartonizers to take and put in the shipping cartons. There are 3 cartons on each side of the table. Girls on one side and boys on the other. Cartons are arranged by age group and there can be 4 cartonizers on a full table. This is a busy job and can be interesting as they are trying to fit odd sized boxes in cartons. In an ideal world all the boxes would be OCC go boxes and fit 23 to a box easy peasy. But with so many different sizes and shapes coming through this job becomes like solving a puzzle. Those working in this job have empty cartons below the table to be prepared for when they fill a box and send it off down the conveyor belt. It’s at this point that the boxes that have scanning labels are scanned. One of the volunteers has a scan gun around their neck to zap the code on the box and the code on the carton it is going in. Speaking of scanning the boxes, each day when you walk in they already know where that days boxes are going and there is a large white board near the entrance showing the 2 or 3 locations you are processing for that day and also showing the number of boxes that have been processed to date. Occasionally one of the days locations may be labeled “hard to reach” or “sensitive location”. This means that to protect the ministry workers in that country we don’t advertise that we are sending boxes in. These are often countries that are hostile to the gospel and Christianity. Once cartons are sent down the conveyor belt they are taped and put on pallets ready for a fork lift to take them to the trucking containers to be sent out of if they are not ready to head out (in the Charlotte PC) they may be put in an area for future shipment. When you sign up for shifts to volunteer you can usually pick 4, 6 or 8 hour shifts. Our group usually works 9-1 and then again from 5 till the end of the day. We will come the second day from 9-1 again and then make our 5 hour drive home. I know groups that like to come for one 8 hour shift. It’s pretty flexible. You can choose to take a break if you like and throughout the morning there are some mandatory breaks where one of the OCC employees gets up to share how many boxes have been packed that day, where they are going and then share some other neat info about the ministry. 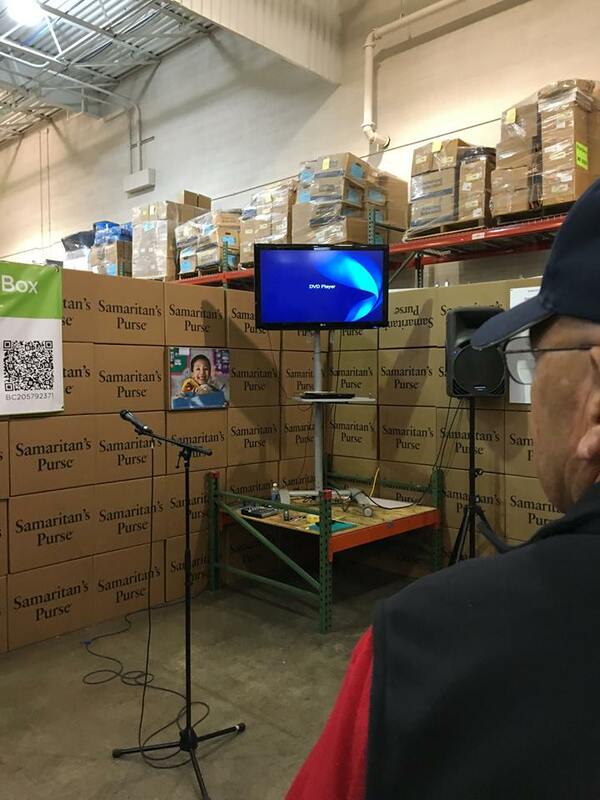 Often there will be a full circle speaker—someone who received a shoebox as a child and now speaks for the ministry about what that meant to them. That’s always one of my favorite times of the day. The best part??? When they are done sharing info we all put our hands on the nearest box and everyone prays for all these boxes and the children that will be receiving them. It’s pretty powerful to have over 1000 people praying together for the very same thing. During processing there is usually Christmas music playing and lots of super amazing people to meet. Some people wear fun hats or shirts that light up and everyone is GLAD to be there. It makes my heart smile to see this well-oiled machine in action. My husband and oldest son usually leave their shifts sweaty, sore and tired and about as happy as I’ve see them. They love getting into the hard work and helping. My husband said one of his favorite things is the energy in the place and just being surrounded by other excited, positive people. I have to agree, being with all these like-minded people who love this ministry like I do just inspires me. Because we go the same two days every year we often run into the same volunteers each year who also go the same two days every year. It’s an added fun moment to run into your once a year friends. At the Charlotte PC there are .25 sodas, water and snacks and Dominos and Chick filA come out to sell food for people who take their lunch or snack breaks. You can also purchase, hats, mugs, shirts, ornaments and books. If you see something you like get it fast because it probably won’t last. Each volunteer gets to grab a tee shirt and ornament as they leave as a thank you from the ministry. Someday I think I might make a quilt out of the PC tee shirts I’ve collected. It really is hard to put to paper the excitement and joy of working at the PC but I hope this can give you some idea of what it is like! I know there are many that for whatever reason may never be able to make it there to volunteer so I hope this gives you a little glimpse of what it’s like! The next step is is to deliver the shoeboxes. We have shared various Operation Christmas Child distribution stories you may like to read. Thank you . this is so informative. I'm curious. what percentage of boxes do you feel are actually filled correctly and don't need items removed and or filler? I asked Stephanie and she said: "Wow, that's a great question. In my experience maybe 60% are ones I think were filled full, well rounded with needed items and had shipping." Great read! I went for the 1st time to Atlanta last year & loved it! It was great to be able to see the "next step" for the boxes we pack. One of the best parts for me was also the prayer time and just seeing the hundreds/thousand boxes in one room. My table team had a great time joking around while doing our jobs. Whenever we would get a box completely filled we would celebrate - whooping & hollering. Pretty soon lots of tables were doing that - it was cool to hear the excitement all around. I too was a little upset when I came upon a box with very few items. I found myself judging the person who had packed it. Then I stopped myself and thought, "What if that was all they had? How do I know?" So, I tried to stop judging and be thankful that we had filler items to add. Pack on!!!!!!!!!! Yes, thankful for fillers. It's difficult to know what to pack the first time, and I think we get better with practice. Another blogger shared about an almost empty box that had a photo of an elderly lady and her dog along with a note. Guess what? God used that box, too. And maybe that old woman's prayers were worth far more than anything else that could've been packed. We can't know the situation of others. We packed a full "career box" for 14 yr old girl this year, and I just realized that it had no school supplies in it. It's okay - God will pick up the slack. I have a question about that. 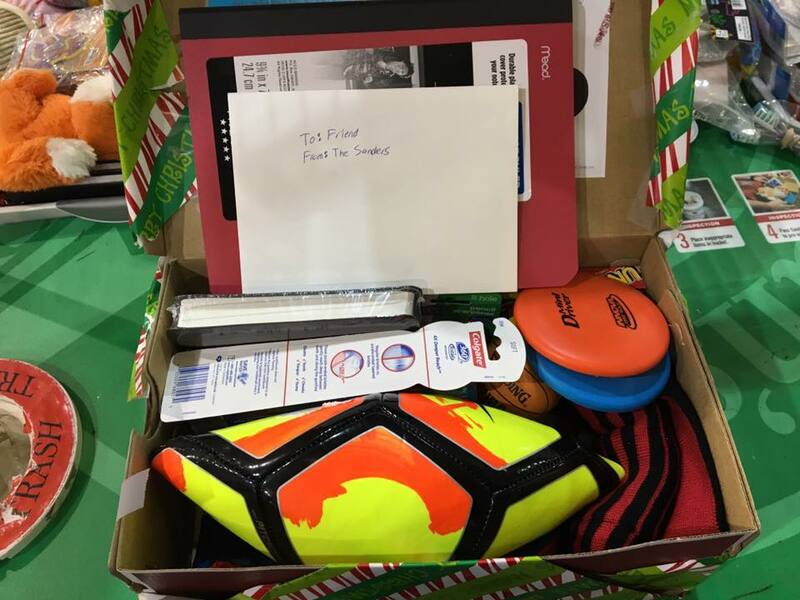 We packed a "Sports Box" for a 10-14 boy this year, purposefully filling it full of balls and other sports gear. It did not contain school supplies or hygiene items. Does that mean the contents would have been changed at the processing center? 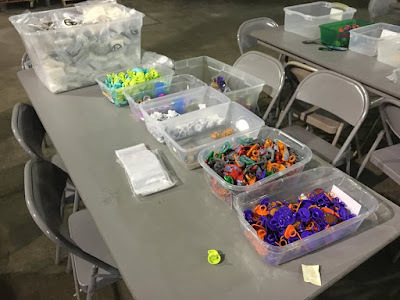 This was actually a guest post, so I'll check with Stephanie-but my understanding is that nothing is changed at the processing center EXCEPT for do not send items or something may be added to a less than full box, but the don't change boxes to meet what processors think would make it well rounded. That sounds like a fun box! Julie, The quick answer is NO your boxes won't changed at all. As long as there is nothing inappropriate they will NOT change it. So pack away. Some people on some of the online sites get a little worked up about what is the "best" box but boxes are as different as people and if you are following the rules about what can go and not go then it's ok. Happy packing!